And lost with no help from the untroubled trees. I beamed at the man, standing masked among trees. And so we stood separate, surrounded by trees. As he led us back homeward, a curious pair. Will lead me back to him, a ghost among trees. Blindspot picks are supposed to be films that one has been meaning to see for a long time and hasn’t gotten around to it. Into the Forest of Fireflies’ Light (or Hotarubi no Mori e) certainly fits that definition for me. It has long been included in other people’s lists of favorite anime, typically alongside Studio Ghibli films, and I couldn’t put it off anymore. I was even proud that I had been able to avoid spoiling the ending, and now that I’ve seen it… I don’t want to say I’m disappointed, just that I thought there would be more to it. I should have known not to expect too much, based on positive reviews noting its simplicity, and indeed that simplicity is one of its key strengths. 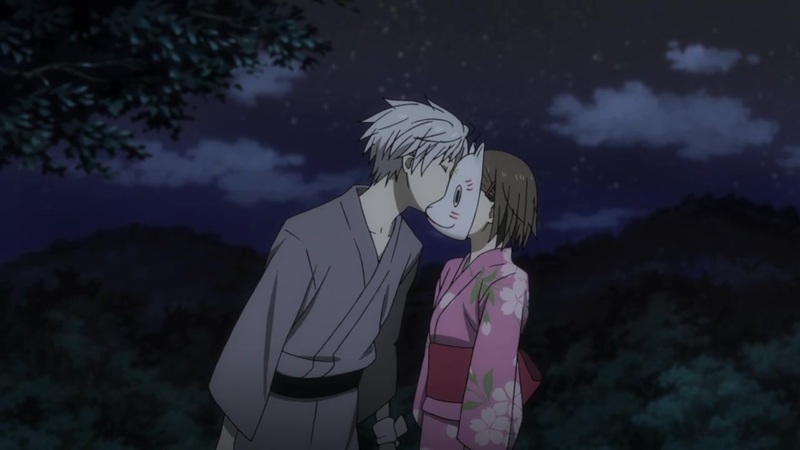 The story follows the relationship of a girl named Hotaru who, while lost in a forest at six years old, meets a young man in a mask. Though he insists that no human should touch him, lest he disappear forever, she continues to visit him, and the two become close friends. Despite the invisible barrier of physical contact, they even begin to love each other, as the girl grows older, returning to the spirit forest year after year. That’s as much as I knew going in, and while there’s a bittersweet payoff that admittedly does hit the emotions hard, that’s pretty much the whole story. There aren’t any subplots and not many extra characters, and frankly the tale didn’t need them. As seen in Makoto Shinkai’s works, such as The Garden of Words, anime films don’t necessarily have to be of feature length to realize their intended effect, and 44 minutes was just right for this one. I will say that it could have been very easy for the story to come off as creepy by nature. After all, a lost little girl meets a masked man in the woods, who hits her with a stick (when she tries to touch him). It might have been a hard sell just describing the plot like that, but instead it’s a sweet friendship/romance that might leave many a viewer brushing away tears. 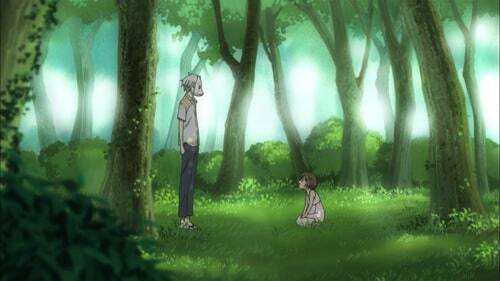 Perhaps its length kept it from hitting me hard enough for that, or perhaps I was just expecting too much, but Into the Forest of Fireflies’ Light still worked well as a mini-tearjerker with some lovely animation from the studio Brain’s Base, albeit nothing exceptional. With a few traces of Ghibli-esque whimsy, it’s a touching little fantasy for those looking for a tug on the ol’ heartstrings. Hey, here’s a film on my own “to watch” list! As always S.G., a solid review and a very good poem as well for this one. “Simple” can be a wonderful thing, but perhaps disappointing as well when expectations are high or long-awaited on something, but this genuinely seems like an emotional little film based on everything described here. And well…can’t really go too badly with a Studio Ghibli pick. Thanks, AniB! I agree simplicity is usually a good thing; it’s my own fault for expecting more. This actually isn’t from Studio Ghibli, but it had a touch of that style of whimsy, so I’d recommend checking it out yourself some time.